Dubai, United Arab Emirates – 1 November 2018: A unique Land Rover Defender Works V8 is now on permanent display in the new Designer Street Room at Selfridges’ flagship department store in London, having been inserted through a first-floor window and reassembled on the menswear floor. 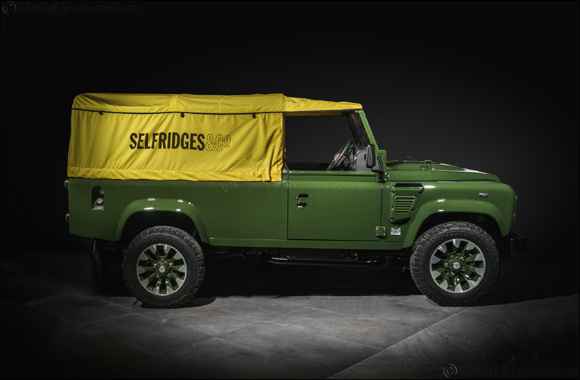 Created as a one-off vehicle, the Selfridges Edition is based on the 405PS Defender Works V8 – 70th Edition and features a number of bespoke elements, including Bronze Green paint, a branded hood in trademark Selfridges yellow, retro-style seats with custom stitching, and unique Selfridges badging. Having been craned into the store’s first floor as a kit of parts, a team of five Land Rover Classic workers constructed the Defender in full view of the shopping public in just over four days. More than 930 hours of expert craftsmanship have gone into creating this unique vehicle, which started life as a 2016 Defender 110 2.2 TDCi Pick Up at Jaguar Land Classic Works in Coventry almost five months ago. Like Land Rover, Selfridges has a rich UK heritage. The famous store was the brainchild of American Harry Gordon Selfridge, who arrived in London in 1906 and opened his first Selfridges store in 1909 at its current site on Oxford Street. This year Land Rover is celebrating its 70th anniversary while Selfridges will celebrate 110 years of trading next year.